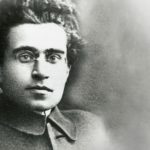 Antonio Gramsci was an Italian Marxist philosopher and politician. He wrote on political theory, sociology and linguistics. He attempted to break from the economic determinism of traditional Marxist thought and so is considered a key neo-Marxist. He was a founding member and one-time leader of the Communist Party of Italy and was imprisoned by Benito Mussolini’s Fascist regime. "My practicality consists in this, in the knowledge that if you beat your head against the wall it is your head which breaks and not the wall – that is my strength, my only strength."